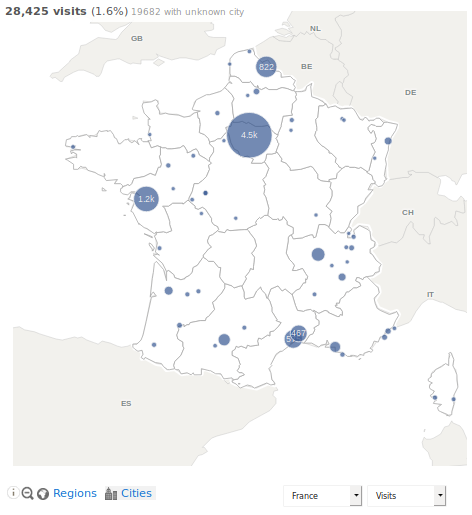 How to change the metric being plotted on the Map? Seeing one’s visitors on the world map is something a bit special, which brings us a bit closer to our audience. In Matomo (Piwik) we are proud to offer beautiful World Maps, that let you see your traffic at a glance, and lets you see more details as you zoom in. When you are looking at a particular Country, you can on the icon to display the Map showing Visits aggregated by City. Note that for easier visualizations, Cities that are close together are “clustered” in a bigger blue marker. This prevents displaying hundreds of cities markers and keep the map actionable. 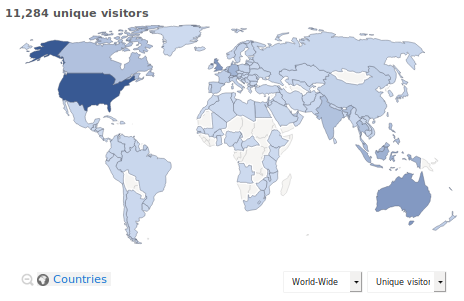 By default, the map shows the number of Visits by country. You can select another metric (page views, time per page, bounce rate, etc.) 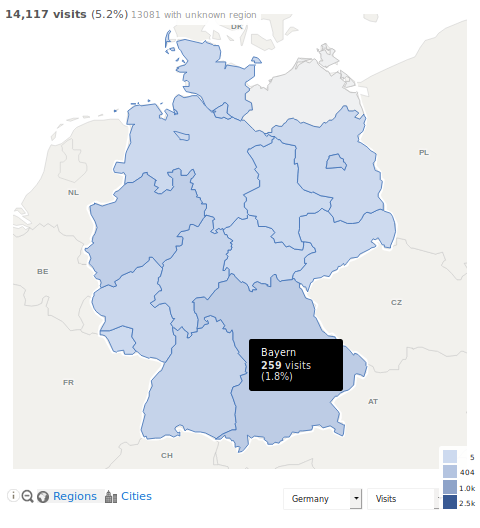 in the bottom-right selector to refresh the map, and show for example bounce rate per country. Check you are using a modern browser. We recommend latest version of Firefox. Make sure the plugin UserCountryMap is enabled. If you still have a problem, please ask in the forums. See also: Real Time World Map showing individual visitors.